Before you start coding a web application. You must read this. An excellent resource for you to know before you code. Visit http://www.html5rocks.com/en/tutorials/internals/howbrowserswork/ for in-depth tutorial. Nagios - How it works, the workflow! While working on a Nagios setup, its often difficult to explain how it works. I beleive in principle of "A picture says thousand word". Hence, started searching the internet, but didn't found any which is simple and easy to understand. So created my own. 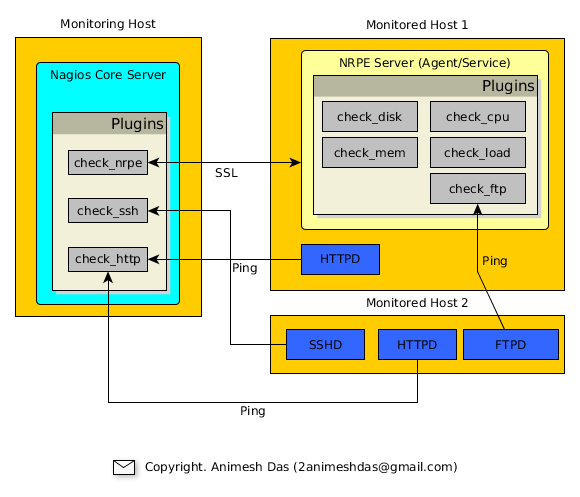 For all those Nagios lovers, here's my version of it. Hope this helps many people, like me! If you are new to amazon's web services aka. Amazon cloud you must go and visit slideshare,search for aws. There are end number of documents and presentations to help you to start with. But before heading to slideshare, please read all the official whitepapers. How to check if the host is running as Virtual Machine (VM) or Physical Machine? and more importantly which Virtualization technology? dmidecode | grep -i "vm"
On longer-running systems, you may need to grep /var/log/dmesg instead. You should just examine the output of dmidecode directly rather than trying to grep as above, in case the output changes. QEMU, for example, doesn't report the vendor in all versions. The following bash script can also be used. # Copyright (C) 2008-2011 Red Hat Inc.
# out one of more lines each being a 'fact' about the virtualization. # Please see also the manual page virt-what(1). # This script should be run as root. echo " --help Display this help"
echo " --version Display version and exit"
# Handle the command line arguments, if any. # Deliberately undocumented: used for 'make check'. # Add /usr/libexec to the path so we can find the helper binary. # Check we're running as root. fail "this script must be run as root"
# helper program to get this information. # Check for various products in the BIOS information. # Note for the purpose of testing, we only call uname with -p option. # cpuid check added by Chetan Loke. # which also has the same manufacturer string in the SM-BIOS data. # Added by Laurent Léonard. # Check for OpenVZ / Virtuozzo. # Added by Evgeniy Sokolov. # /proc/bc - exists on node, but not inside container. # Check for IBM PowerVM Lx86 Linux/x86 emulator. # Check for Hitachi Virtualization Manager (HVM) Virtage logical partitioning. # Check for IBM SystemZ. # This is unlikely to be correct. # PV-on-HVM drivers installed in a Xen guest. 1) # Could be some sort of virt, or could just be a bit slow. # skip this test if we know it is Xen. # another CPUID leaf for non-accelerated qemu. Click here to download/view my Resume/CV. Build your own private cloud using Ubuntu Eucalyptus Enterprise Cloud computing platform. Downloadable Ebook : Build your own private cloud using Ubuntu Eucalyptus Enterprise Cloud computing platform. Copyright © 2012 Animesh Das. All Rights Reserved.